Old and new often mix in Japan. Temples built hundreds of years ago sit in the foreground of modern skyscrapers. Women in kimonos stand beside women in miniskirts at the train station. I was lucky enough to witness such a dichotomy from the comfort of our living room today. Construction on two new homes started last week in the empty lots across the street from our apartment. Backhoes and jackhammers have been breaking down old concrete and leveling the dirt from 6 a.m. to 6 p.m. for the last week. This truck appeared with tents, tables and chairs. This morning, there were more cars than dump trucks, which piqued my curiosity. A tent and chairs were set up and dignitaries began to arrive. While I’ve seen groundbreaking ceremonies for buildings or stadiums, I’d never seen one for a house. The Japanese have a tradition called Jichinsai. 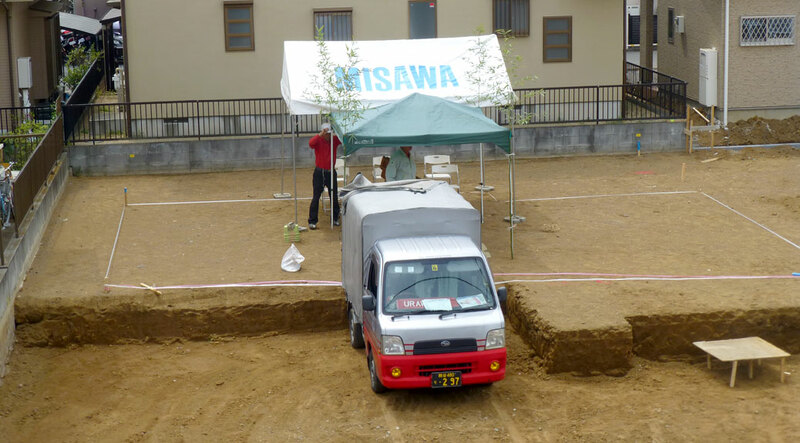 Jichinsai is a Shinto ritual to appease the god (kami) of the earth when construction begins on a new structure. It is believed that the failure to ask for the blessing will result in a failed project, complete with crumbling structures and worksite injuries. It’s OSHA’s biggest nightmare! The Jichinsai site is ready and waiting for its honored guests. The setup of the tent and chairs took longer than the actual ceremony. I tried to respect the ritual by limited my own noise, difficult considering I was watching game 4 of the Portland Trail Blazers vs. Houston Rockets playoff series. The ceremony itself consists of a kouton (the summoning of the kami), chanting and paying of respects to the kami, and finally the shouten (the returning of the kami). 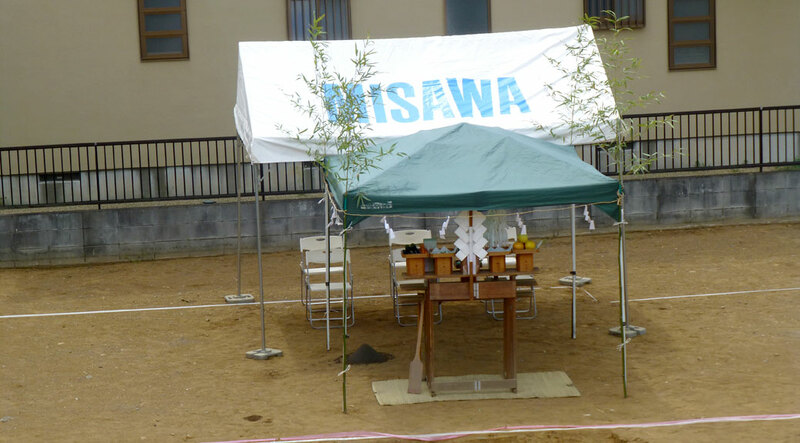 Everything from the placement of the bamboo trees to the lining of the area with sacred rope (which looked a lot like the twine we used for a clothesline) is consistent with the ceremony. Watch the Jichinsai video to hear some of the chanting in the ceremony. All kidding aside, it’s an honor to be able to witness the things we do in Japan. Coming from a country with only a couple hundred years of its own history and mostly inherited traditions, it’s impressive to see hundreds or thousands of years of customs carry forward to the modern day. Thanks for including the video with sound. What a neat experience for you.